The ball press compresses the lime powder into a briquettes, which can replace the lime block as a good desulfurizer in the converter steelmaking. At the same time, in the production of calcium carbide, the lime briquettes can also replace the lime block to smelt the calcium carbide. The ball press machine improves the utilization rate of waste materials and has good economic and social benefits. Driven by the motor, the two rollers rotate in opposite directions; the surface of the two rollers is processed into a dimple of a three-dimensional ellipsoid; the forced and extruded material is pre-compressed by pre-pressing screw to form a certain density, and then passes through the inlet port. 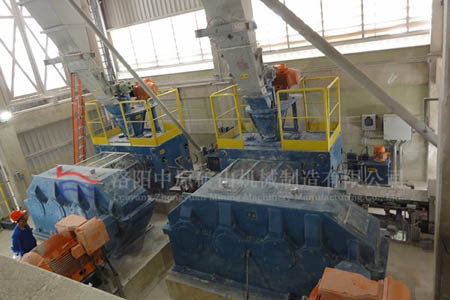 Between the two rollers, the material is forced into the double rollers dimples is pressed into a three-dimensional ellipsoid by means of two rollers, and discharged through belt conveyor of the ball press. In the past, most of the lime powder in China’s metallurgical industry was abandoned, resulting in a great waste of resources. With the increasingly tight resources and energy, the utilization of lime powder in the metallurgical industry has received more and more attention. Since the 1990s, our company has explored and researched with relevant institutions in the domestic metallurgical industry to solve this problem. The high-pressure lime powder ball press is used to press the kiln powder into pellets for smelting. Currently, our high pressure ball press has been widely used in steel mills at domestic and abroad.